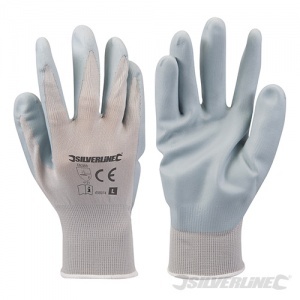 The Silverline Foam Nylon Nitrile Gloves provide the user with peace of mind when handling unknown or potentially dangerous objects, the gloves are heavy duty and a great choice for handling sheet metals and general handling tasks. With a knitted wrist, the Silverline Foam Nylon Nitrile Gloves protect from any dirt getting inside the glove, ensuring the gloves last longer and hands are protected and kept clean. 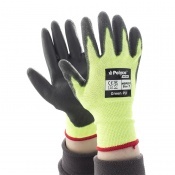 This makes the gloves ideal for use when working in environments around dirt or in the outdoors. The Silverline Foam Nylon Nitrile Gloves features a foam Nitrile coating to the fingertips and palm to protect the area, the coating is durable and flexible to ensure comfort during wear. 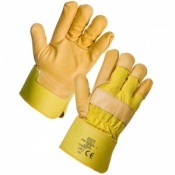 Nitrile provides an excellent grip and is resistant to grease and oil. The coating also allows for great dexterity for awkward tasks. With a 13g seamless nylon knitted shell, the Silverline Foam Nylon Nitrile Gloves are abrasion resistant. 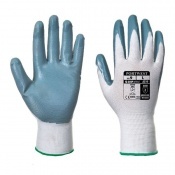 The Silverline Foam Nylon Nitrile Gloves are supplied in a universal size Large that should fit most. The Silverline Foam Nylon Nitrile Gloves are supplied in pairs or in a pack of 10 pairs.